PRELIMINARY SPECS "Somerset" is one of the nicest 58 West Bay's on the market. She is a one owner vessel that has been kept in freshwater her entire life, which offers a rare opportunity to own a low-hour, lightly-used West Bay. 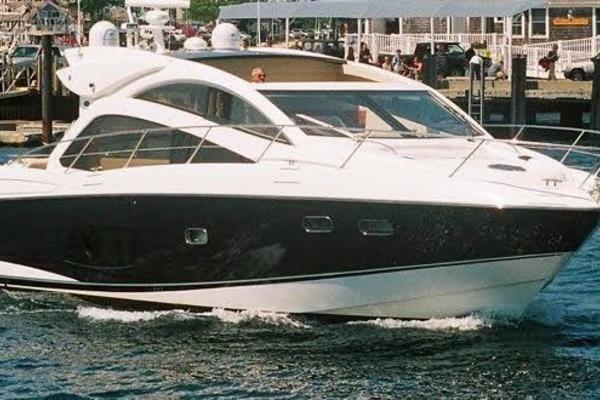 United Yacht Sales New Jersey would love to guide you through a personal showing of this 58' West Bay Cruiser 1998. This yacht for sale is located in St. Charles, Missouri and priced at $495,000. For a showing please contact us by filling out the form on this page and we will get back to you shortly! “SOMERSET” is one the nicest 58’ West Bay’s on the market. She is a one owner West Bay kept in freshwater her entire life which offers a rare opportunity to own a low hour light used West Bay. The West Bay 58’ Motoryachts is one of the highest quality yachts ever built in its size range. Built just outside Vancouver,CA by a Dutch family that has been in the boat building business for generations. The West Bay 58’ offers a large Cockpit with a transom door that flows out to the Swim Step. Below the Cockpit is a large Lazarette storage area. From the Cockpit/Aft Deck you enter the Salon through double doors with a large U-shaped sofa to port and occasional chairs to starboard for a casual entertaining experience. Going forward and up three steps is a Galley to port with full array of appliances and a large home size refrigerator. Forward of the Galley is the lower helm with great visibility all around and port and starboard Pilothouse doors for easy access to side deck for handling. Going down several steps you will find 3-Staterooms with the Master Stateroom all the way aft and a queen size bed and en-suite head with separate shower stall. The VIP Stateroom is forward with a walk-around queen size bed with a full head and shower stall, which is shared with the third Guest Stateroom.